This post is the third in an occasional series. This site already contains a large number of documents produced by Big Flame or its members. Most can be found in the 30 posts in Episodes in Big Flame History. Each post contains links to documents which relate to its theme. Links to the same documents are also listed on the website’s Publications page, this time sorted by type – pamphlets, journals, newspaper, internal documents. This series aims to add to these documents by making available others I find interesting which didn’t fit with any of the post themes, were overlooked when the posts were written, or a copy was not available to me at the time of the post. A wide variety of different sorts of documents have been published on this site. However up to now, there has been little in the way of Big Flame’s more agitational publications. This most aims to provide a few examples of leaflets and a Bulletin. Over the years Merseyside Big Flame attempted to intervene at a considerable number of different industrial workplaces. However, the one which was the most long lasting and involved the most effort on the part of members was the Ford Halewood Assembly Plant. The documents in this post were handed out or sold outside the gates to Ford workers. First, three examples of leaflets. Halewood carries on the Fight April 1971. The nine week “parity strike” at Fords took place in January-March 1971. The objective was to bring the wages of Fords workers operating under a Measured Day Work system in line with Midlands car workers on piece rates. The eventual settlement was Initially oppose by workers at Halewood, whilst other plants accepted the offer. 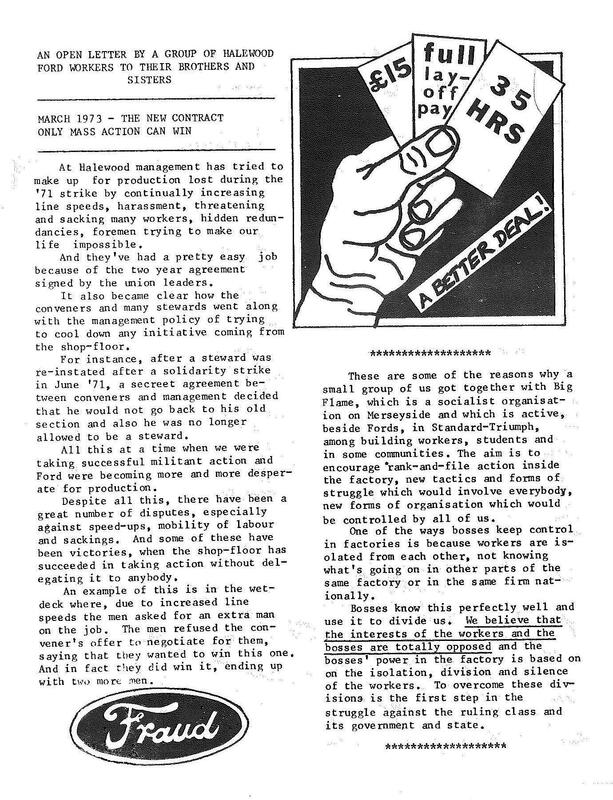 This leaflet was produced on the 7th April, the day mass meetings at Halewood decided to go back to work. It argues that the problem is not individual trade unions leader like Jack Jones and Hugh Scanlon who had called for an end to the strike. Rather the differences between rank and file power and trade union officials. The Fifth Column at Fords November 1971. The starting point of this leaflet was a dispute in the PTA (Paint, Trim and Assembly), one the two main parts of the Halewood site. It looks at the role of foremen in pushing through speed ups, and argues for collective mass action as the only way to oppose them. An Open Letter by a Group of Ford Halewood Workers to their Sisters and Brothers September 1972. The “parity strike” settlement was a two year deal which expired in March 1973. This leaflet reminds workers of developments in the plant since 1971, and sets out a list of demands for the new contract. As well as the leaflets there was a Bulletin. Consisting of around 12 to 20 duplicate pages, it sold for 2p. There were 14 issues between 1974 and 1976. 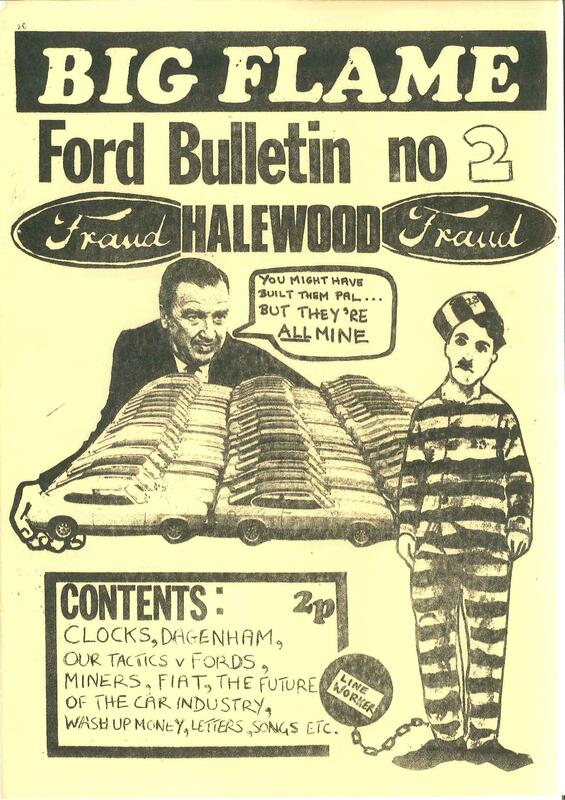 Halewood Bulletin no 2 1974. This is one of the earlier issues. It reflects the typical mix of articles about what is happening in Fords with events in the wider world (in this case the new Labour Government’s “Social Contract”). For some context on how the perspective in the leaflet and bulletins fitted into Big Flame’s developing positions, see the post on Industry and Workplace. Big Flame gave an extremely high importance to struggles at the point of production, especially in its early days. The early Big Flame adopted the base group model derived from sections of the Italian left like Lotta Continua. The aim of these interventions was to target activity at the mass of workers (often the deskilled line worker) rather than to work through union structures. Instead of a political group deciding that its members would get jobs in a factory (as has been the practice with some groups), the intervention was initiated by external militants who developed regular contact with those working at the factory. The basic activity was regular factory gate leafleting. Through this workers were invited to open meetings, where they had the final way over the content of the next leaflet. This is because it is the workers who have the understanding of what was going on in the plant. The aim was that the workers would develop confidence and power, and eventually take over the group. No pressure was put on them to be recruited to the organisation (this is true of Big Flame at least, during this period). In October 1971 Merseyside Big Flame established three base groups. One was at the Ford Halewood plant in Liverpool. The other two groups – at Standard Triumph (another car plant) and Plessey (telecommunications) – only lasted a short period. Other Big Flame interventions in the motor industry followed Ford Halewood. Ford Dagenham (near East London) in January 1973 (by people who later formed East London Big Flame), British Leyland Longbridge (Birmingham) in January 1975) and Ford Langley (near West London) in February 1975. As of 1975 the situation at Ford Halewood was: 2 external militants who had this work as their main area of political activity, 1 Ford worker member, 3 other Ford workers consistently attending base group educational meetings, another 30 Ford workers consistently attending open meetings and around 120 copies of Big Flame newspaper sold at the plant. This document, a report to the October 1976 Big Flame Conference, gives a vivid picture of base group activity on a day to day basis.Click here to view Ford Halewood Report (warning: this may take over a minute to appear). By 1979 Big Flame’s Ford Halewood intervention had suffered a serious decline, with the base group gone. The problem with the base group approach was its dependence on the external militants. If they moved away from the area, got a job or were burnt out by continuous activity, the intervention suffered a serious blow. Later Big Flame workplace interventions were almost always through members working in the sector. The original (1970) Big Flame newspaper involved left stewards who wrote for the paper. However, in 1971 Big Flame reassessed its position on stewards. A strike at Ford Halewood over the sacking of a militant steward met with a lack of enthusiasm from the other stewards. 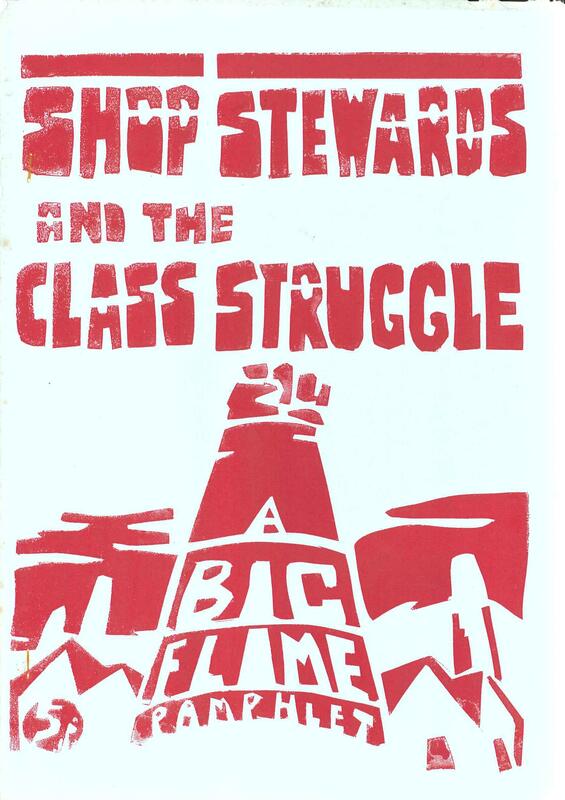 In 1973 Big Flame published two pamphlets Shop Stewards and the Class Struggle and Five Months of Struggle at Halewood. The former set out a critical perspective on shop stewards (as opposed to others at the time like the International Socialists who were promoting them as a key element of the struggle). Stewards were increasingly being integrated into the union hierarchy and management. They were encouraging passive delegation and holding back working class autonomy. The second pamphlet developed a similar argument in the specific context of Ford Halewood. Click here to view Shop Stewards and Class Struggle (warning: this may take over a minute to appear). Two of the six sections of Five Months of Struggle at Halewood were republished as “Shop Stewards at Ford” in the US magazine Radical America. Click here to view Radical America September-October 1974 issue at the magazine’s archive on the web. (The article can be found at pp119-139 of the magazine, pp121-141 of the document). Big Flame later clarified its position on stewards, recognising that not all workplaces were like the motor industry. The approach to shop stewards, indeed whether or not to become a steward, depended on where you worked. Click here to view Reply to a Letter to Big Flame, reprinted from the May 1977 Internal Bulletin (warning: this may take over a minute to appear). A similar perspective was set out in a 1977 pamphlet The Working Class, the Unions and Mass Practice. Car plants were not the only place Big Flame organised. Hospitals were another early priority. By that late 1970s there were Big Flame members involved in struggle at a wide variety of workplaces including rail, the mines, engineering and the public sector such as local government. 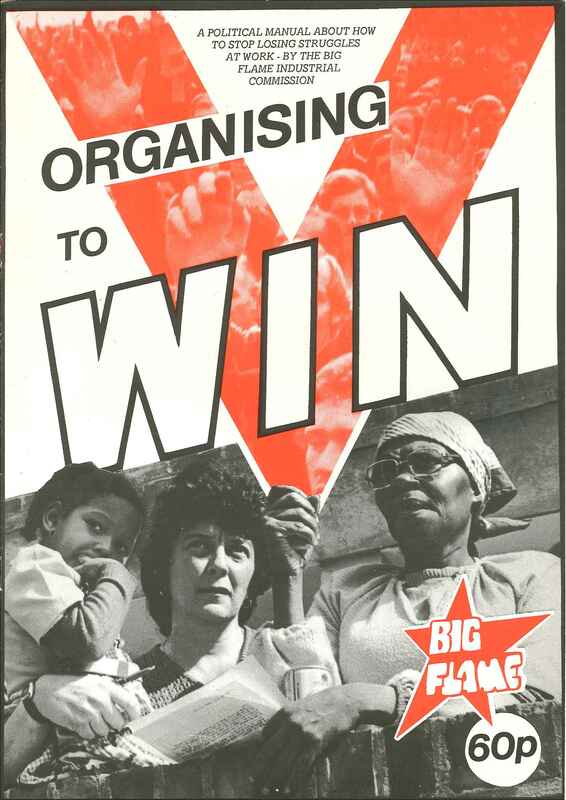 In 1979 Big Flame published a pamphlet Organising to Win which brought together the experience of workplace activists. It aimed to be a manual on how to win struggles in a difficult period.